Brylane Home has a motion activated soap dispenser for only $14.99. I must have an odd fondness for public restrooms since this gift item appeals to me. Don’t think too hard on that one. The reality is this is a nice little gift at a fair price. Yeah, the person receiving this item probably won’t have it in 10 years and it might not even make it a year. It is still a neat gift. Code BHPRESIDENT currently provides free shipping on orders over $25. 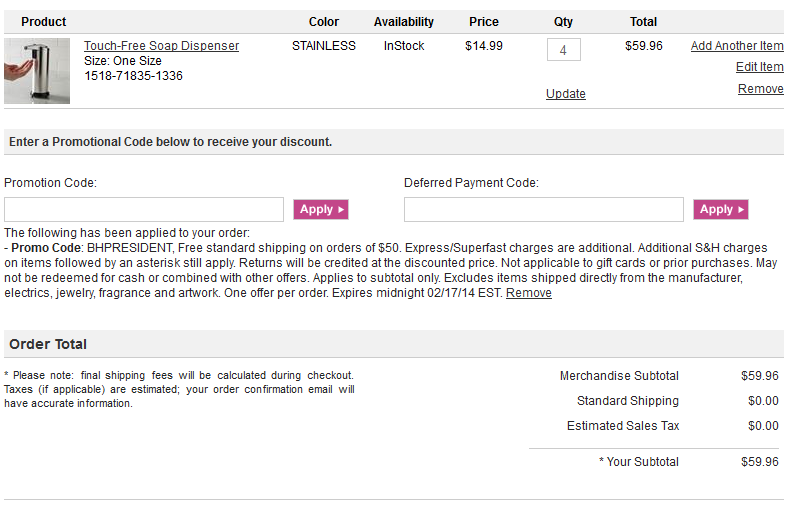 Here is a sample order with this item in my cart 4 times to qualify for free shipping. I must be getting kind of old. It still seems largely like magic that an appliance can sense my motion and decide to spit a slippery substance at me as a result. It is even more magical when said appliance can do this for less than fifteen bucks. This really is one of those instances where we should thank our lucky stars for cheap Chinese labor. We really are living in a golden age of buying neat crap at rock bottom prices.